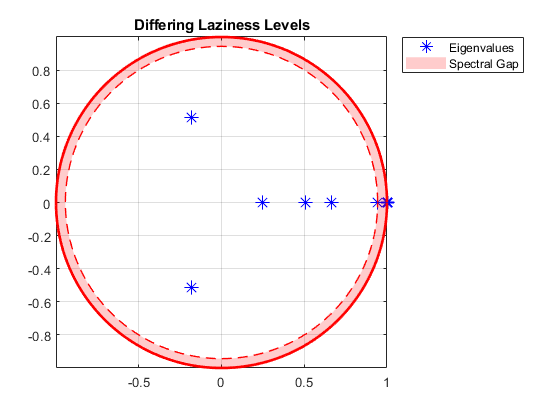 lc = lazy(mc) transforms the discrete-time Markov chain mc into the lazy chain lc with an adjusted state inertia. lc = lazy(mc,w) applies the inertial weights w for the transformation. Create the irreducible and periodic Markov chain that is characterized by the transition matrix P.
At time t = 1,..., T, mc is forced to move to another state deterministically. Determine the stationary distribution of the Markov chain and whether it is ergodic. mc is irreducible and not ergodic. As a result, mc has a stationary distribution, but it is not a limiting distribution for all initial distributions. 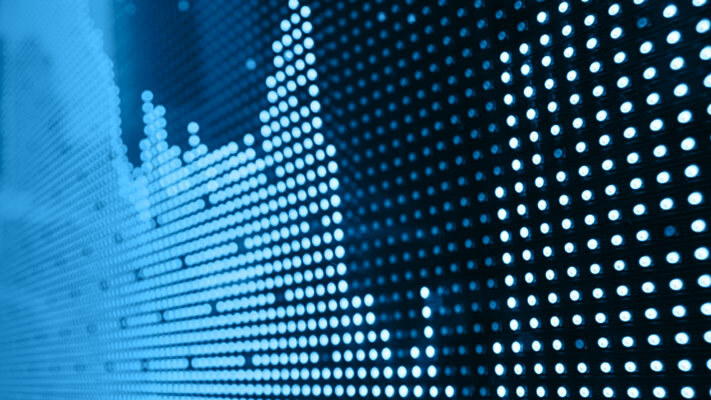 Show why xFix is not a limiting distribution for all initial distributions. The initial distribution is reached again after several steps, which implies that the subsequent state distributions cycle through the same sets of distributions indefinitely. Therefore, mc does not have a limiting distribution. Create a lazy version of the Markov chain mc. lc is a dtmc object. At time t = 1,..., T, lc "flips a fair coin". It remains in its current state if the "coin shows heads" and transitions to another state if the "coin shows tails". Determine the stationary distribution of the lazy chain and whether it is ergodic. lc and mc have the same stationary distributions, but only lc is ergodic. Therefore, the limiting distribution of lc exists and is equal to its stationary distribution. 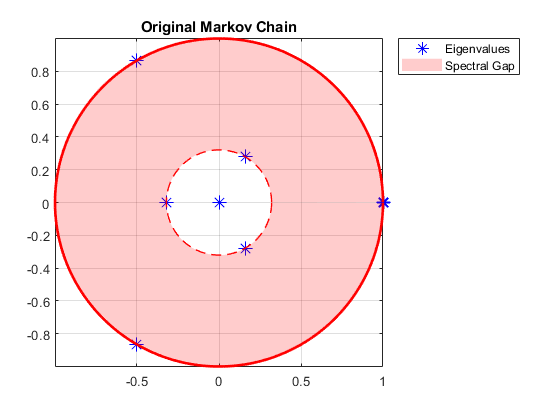 Create lazy versions of the Markov chain mc using various inertial weights. 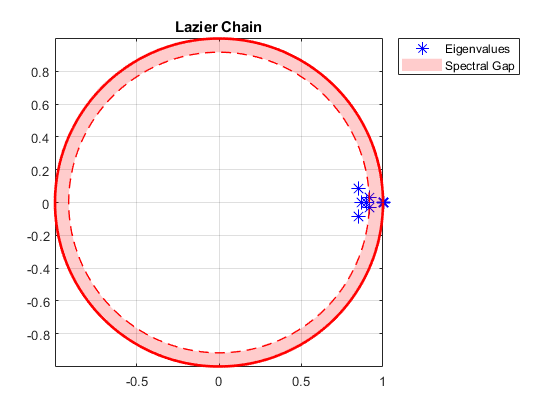 Plot the eigenvalues of the lazy chains on separate complex planes. 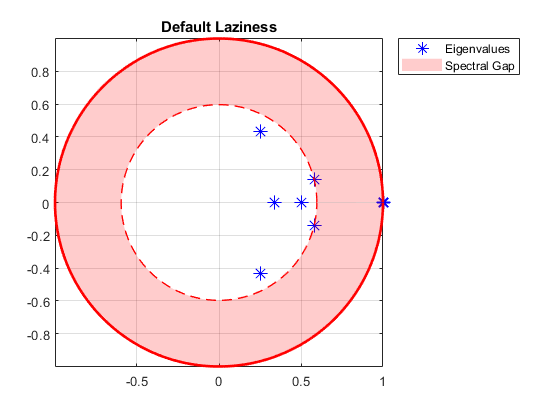 All lazy chains have only one eigenvalue with modulus one. Therefore, they are aperiodic. The spectral gap (distance between inner and outer circle) determines the mixing time. Observe that all lazy chains take longer to mix than the original Markov chain. Chains with different inertial weights than the default take longer to mix than the default lazy chain. Inertial weights, specified as a numeric scalar or vector of length NumStates. Values must be between 0 and 1. P is mc.P and I is the NumStates-by-NumStates identity matrix. If w is a vector, lazy applies the weights state by state (row by row). Discrete-time Markov chain, returned as a dtmc object. lc is the lazy version of mc. A lazy version of a Markov chain has, for each state, a probability of staying in the same state equal to at least 0.5. In a directed graph of a Markov chain, the default lazy transformation ensures self-loops on all states, eliminating periodicity. If the Markov chain is irreducible, then its lazy version is ergodic. See graphplot.